The Green Team is the ministry group responsible for designing and implementing the church’s Green Certification Program, a national program sponsored by GreenFaith, the interfaith coalition for the environment based in New Jersey. We are the first church in Morristown to engage in this rigorous two-year commitment. 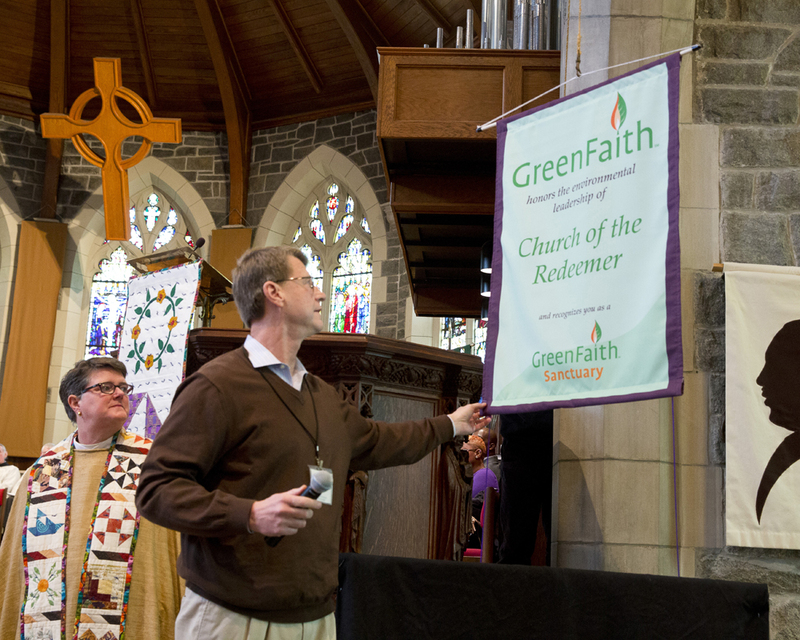 In February 2014, Redeemer was awarded its GreenFaith certification in a ceremony during Sunday worship. We were honored by the presence of Stacey Kennealy, Certification Program and Sustainability Director for GreenFaith, who presented our church with its banner. It would not have been possible without the hard work of the Green Team, led by Gary Matthews. Because we are called to “seek God’s justice and wholeness for this earth and all its inhabitants,” the Redeemer Green Team is committed to infusing care for the environment into our congregation’s worship, religious education, justice initiatives, spiritual practice, and stewardship. Our actions are intended to move our church community toward greater sustainability, both in fact and in spiritual consciousness. Read our action statement.